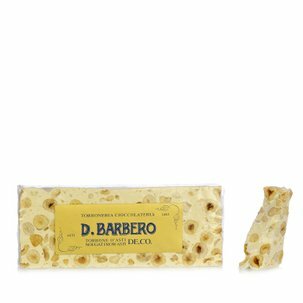 Davide Barbero is outstanding with its superb premiata torroneria line, which includes the mouth-watering Asti crumbly nougat. 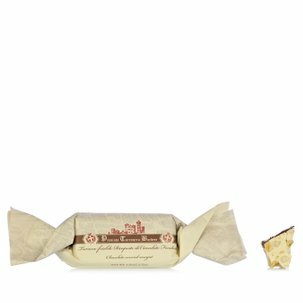 Made with prized Piedmont IGP hazelnuts, which give it its characteristic flavour and texture, this nougat is ideal for a refined Christmas hamper and a perfect treat to enjoy the most ancient Piedmont confectionery tradition. Ingredients Piedmont hazelnuts IGP (51%), honey, candied orange peel, sugar, glucose syrup, fresh egg white, wafers (potato starch, water, vegetable oil), natural vanilla. May contain traces of other nuts. For more information on product labels, please contact our Customer Service department. The information on the labels of the products may vary for reasons beyond our control, therefore, there may be discrepancies between the information on the site and that on the products delivered. Please always check the information on the product before consumption or use. 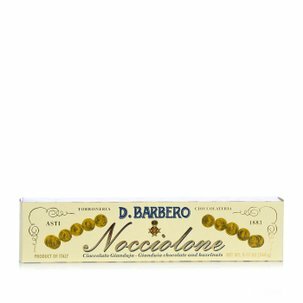 Barbero has been a synonym of nougat since 1883. That was the year when the history of Torroneria di Barbero, the famous Asti nougat maker, began to unfold in Mombercelli. 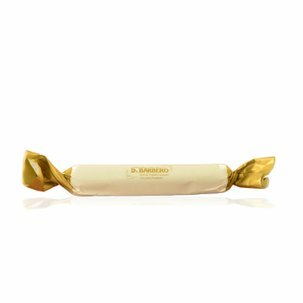 Today as in the past the nougat bars are made exclusively with Piedmont IGP hazelnuts selected by hand, sugar, extra-dark chocolate and selected honey. Torroneria Barbero has kept alive the historic flame of traditional artisanal practices, the original recipes and... the passion!